Brighton kept the pressure on their Championship automatic promotion rivals with victory at Birmingham, whose hopes of a play-off place all but ended. Birmingham led when on-loan Northern Ireland striker Kyle Lafferty slotted in a debut goal, but a glancing Connor Goldson header drew Brighton level. 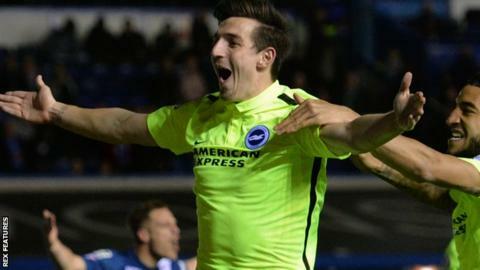 In-form defender Lewis Dunk then rose highest at a corner to nod Brighton ahead shortly after the break. Brighton were rarely troubled late on and remain one point off the top two. Birmingham remain ninth but are now 11 points behind the top six, after wins for Sheffield Wednesday and Derby. Gary Rowett's side have won just twice in 10 matches, while Brighton extended their unbeaten run to eight games. Both Seagulls goals came from Jiri Skalak set-piece deliveries, with both Goldson and Dunk out-jumping their markers to convert fine crosses. Birmingham struggled to create significant chances in the second half as Brighton held on relatively comfortably, and substitute James Wilson should have added a third in the closing stages. "I've warned the players if they think they can take their foot off the gas then they'll be coming in on Sundays and their days off. "I think I'd look a bit stupid if I said we could still get into the play-offs now, the gap's 11 points. "I was really pleased with Kyle Lafferty, when I took him off a fan was screaming he was our only chance of a goal, but he hasn't played a lot of football and needs to be fitter." "If you really want to go for it you have to chase the three points and get them. Winning tonight helps us but it won't take us up. "We weren't aware of Middlesbrough being 2-0 up at half-time, but whether Middlesbrough win or lose, if we win every game we'll have a chance. Well, we won't have a chance, we'll be up. "Everyone has experienced highs and lows on the final day and we hope to be involved in some of the action towards the end." Match ends, Birmingham City 1, Brighton and Hove Albion 2. Second Half ends, Birmingham City 1, Brighton and Hove Albion 2. Foul by James Wilson (Brighton and Hove Albion). Paul Caddis (Birmingham City) wins a free kick in the defensive half. Attempt blocked. James Wilson (Brighton and Hove Albion) right footed shot from more than 35 yards is blocked. Assisted by Liam Rosenior. Corner, Birmingham City. Conceded by Liam Rosenior. David Davis (Birmingham City) is shown the yellow card for a bad foul. Foul by David Davis (Birmingham City). Jiri Skalak (Brighton and Hove Albion) wins a free kick on the right wing. Corner, Brighton and Hove Albion. Conceded by Jonathan Spector. Attempt blocked. Jamie Murphy (Brighton and Hove Albion) right footed shot from the centre of the box is blocked. Assisted by Liam Rosenior. Substitution, Birmingham City. David Cotterill replaces Jon-Miquel Toral. Jiri Skalak (Brighton and Hove Albion) wins a free kick in the attacking half. Substitution, Birmingham City. Diego Fabbrini replaces Jacques Maghoma. Substitution, Brighton and Hove Albion. James Wilson replaces Tomer Hemed. Steve Sidwell (Brighton and Hove Albion) wins a free kick in the defensive half. Dangerous play by Maikel Kieftenbeld (Birmingham City). Substitution, Birmingham City. David Davis replaces Kyle Lafferty. Corner, Brighton and Hove Albion. Conceded by Jonathan Grounds. Substitution, Brighton and Hove Albion. Jamie Murphy replaces Kazenga Lua Lua. Attempt missed. Jon-Miquel Toral (Birmingham City) left footed shot from the centre of the box is high and wide to the left. Attempt missed. Kazenga Lua Lua (Brighton and Hove Albion) right footed shot from the left side of the box is high and wide to the right. Assisted by Tomer Hemed. Attempt missed. Tomer Hemed (Brighton and Hove Albion) header from the centre of the box misses to the left. Assisted by Jiri Skalak with a cross. Attempt missed. Maikel Kieftenbeld (Birmingham City) right footed shot from outside the box misses to the right. Corner, Brighton and Hove Albion. Conceded by Michael Morrison. Attempt missed. Paul Caddis (Birmingham City) right footed shot from a difficult angle and long range on the right misses to the left. Assisted by Jacques Maghoma. Attempt missed. Kazenga Lua Lua (Brighton and Hove Albion) right footed shot from the centre of the box is close, but misses to the left. Assisted by Steve Sidwell with a headed pass. Corner, Brighton and Hove Albion. Conceded by Tomasz Kuszczak. Attempt saved. Tomer Hemed (Brighton and Hove Albion) right footed shot from the centre of the box is saved in the bottom right corner. Assisted by Bruno with a cross. Attempt missed. Liam Rosenior (Brighton and Hove Albion) right footed shot from outside the box is high and wide to the right. Assisted by Jiri Skalak. Goal! Birmingham City 1, Brighton and Hove Albion 2. Lewis Dunk (Brighton and Hove Albion) header from the centre of the box to the top left corner. Assisted by Jiri Skalak with a cross following a corner. Corner, Brighton and Hove Albion. Conceded by Maikel Kieftenbeld.